Fox Outdoors Field Operators Action Pack | BUDK.com - Knives & Swords At The Lowest Prices! bought the camo bag and it surpassed my expectations. very roomy. one thing I like is that the waist strap/belt detaches so you can use it as a utility belt. TIP; the bag comes all smooshed together in the packeging. stretch bag out completely before first use. it will open up a lot! I got this pack to use while flying as a carryon. It will hold a pair of tennis shoes, a full change of clothes, laptop, and all with pockets to spare. It'll easily fit in the overhead of the smaller jets without a problem. The pockets are laid out in such a way that I haven't had to get 'additional searches' like I did with my previous pack even though I'm carrying the same items. I will say that it is a wider than a conventional 'school' backpack. I'm 5'11" and 190 pounds and the straps are just the right width. A few inches wider and I feel I wouldn't be able to wear it. Inside strap to strap is right at 6" at the top and the bottom width where they attach is 13". This doesn't sound like much, but my old J-sport pack is 2" and 12" with curved straps. the picture does not do it justice. if you want an every day pack this is it. i crammed everything i could in it to see how it feels and it rides like a dream. i know it has at least 60 pounds of stuff in it and i can still move squat and climb with not much hinderance so by the time i do put the right stuff in it will be perfect. Roomy, room, roomy! I camp, hike, walk to the grocery store and carry everything on my back and rely on something sturdy and light. There are so many compartments here, making it great for travel as well! 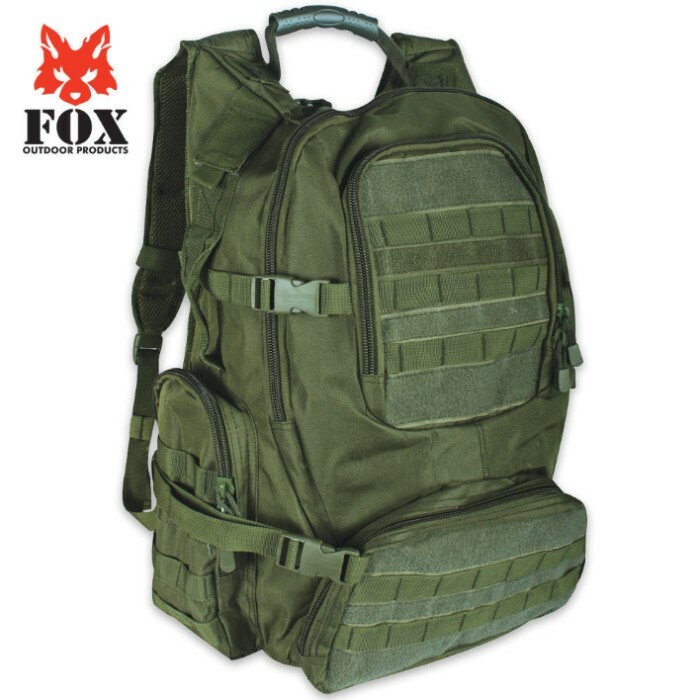 The price for this pack is absolutely a bargain, and its more comfortable than the one I had in the Army. I just ScotchGuarded it too. I've killed 6 backpacks this year including a pricey Haglofs. This one is actually made better! The only thing I would improve would be sturdier straps and more strap padding. Awesome, awesome, awesome. You will not regret buying this! Like stated in the headline awesome pack. Its got space for everything you'll need on an extended camping trip or for a bug out bag. And with its multiple pockets and both inside and out everything stays organized. One last thing with all the adjustable straps and belts its going to stay on your back and stay comfortable. Outstanding pack!!! Quality made. Very durable. More room than I expected. The photo does not do it justice. For me, perfect use for my Bug Out Bag!!! Just what I was looking for!!! Thank you CH Kadels!! !